San Diego Dermatology and Laser Surgery prides itself on having the most cutting edge technology for treatment of unwanted facial or body hair. Today laser hair removal can be performed with very little to no discomfort even in more sensitive areas like a man's back or the bikini line for a woman. Dr. Lupton is the only board certified dermatologist in the north county area of San Diego to have this new technology with relatively pain free treatment - a significant advantage over other laser hair removal systems available today! Laser assisted hair removal is one of the best long-term methods of hair reduction. 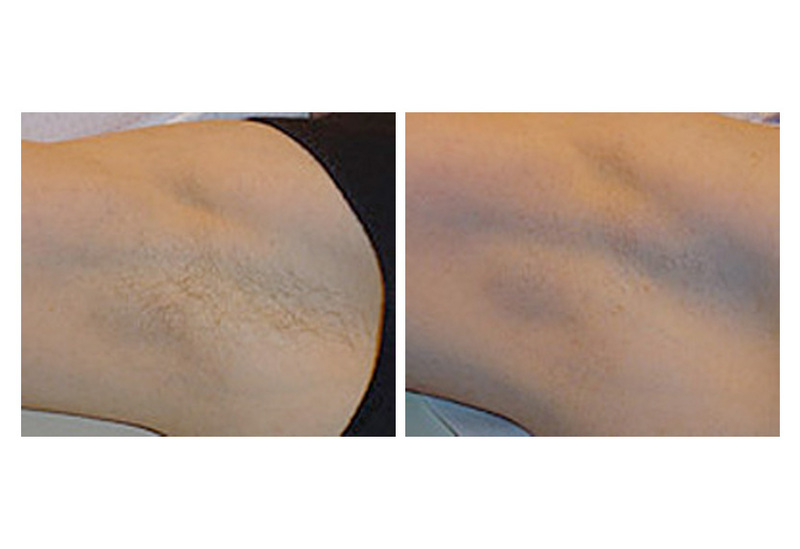 Dr. Lupton has used a variety of hair removal lasers in the past and chose his current system based on its superior efficacy, safety profile in all skin types, and its lack of pain during treatment. Hair removal may be safely performed on virtually any area of the body. The bikini line, underarms and female facial hair typically respond very well to treatment. For men, the back, chest and ears are common areas for hair removal treatment. Ingrown beard hairs (folliculitis, pseduofolliculitis, razor bumps) also respond very well to laser hair removal with a reduction in hairs and bumps. Most patients will see an improvement after just one treatment, but as with any hair removal system multiple treatments will be necessary for optimal results. The FDA Aprroved Clarity™ laser targets hair at various stages of growth, leaving you with smooth, hair-free skin. During laser hair removal, a beam of controlled light is emitted from the Clarity™ laser, penetrating the skins surface. The light is attracted to the pigment of the body hair, and is absorbed by the hair shaft. The laser is then converted to heat, disabling the follicle and inhibiting future hair growth. Although, it is most effective on light-skinned individuals with dark, coarse hair it does offer dual wavelengths that can treat the full spectrum of skin types and hair colors. Patients with tan and dark skin often have to worry about pigmentation issues and adverse effects with other lasers. The Clarity™ is unique because it is specially designed to significantly reduce those risks. Most patients undergo a series a three to five laser treatments administered at three to four week intervals. Subsequent maintenance treatments may be necessary after the initial series at longer intervals depending upon the body location and type of hair being removed. Most patients will notice a reduction in hairs after the first treatment and will see that re-growing hairs are finer and thinner and slower to grow. Maintenance treatments will always be necessary to keep an area completely devoid of hairs. The exact number and interval range for maintenance varies considerably from patient to patient. Dr. Lupton has extensive experience and performs all of his own laser hair removal treatments - a significant advantage over most offices. He employs the latest technology and delivers safe, effective, and rapid hair removal treatments. He can safely treat all skin types in his office with minimal to no risk.